Can Batman take down The Joker — or will he go mad trying? The action is fast and furious in DC Comics Deck-Building Game: Rivals – Batman vs The Joker as players vie to add the right mix of components to their decks, then launch attacks directly at their archnemesis! 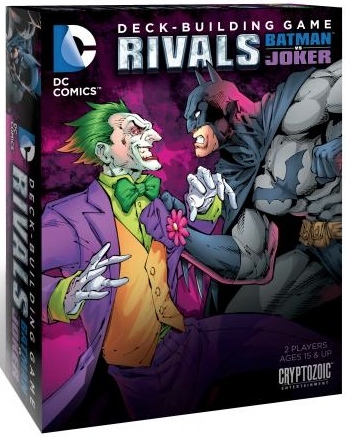 This set, which is compatible with any title in the DC Comics Deck-Building Game series, introduces confrontation rules that allow you to attack an opposing character and block cards that ward off confrontations. The first player to drop the opponent three times wins, although each time an opponent gets dropped, he'll rise up even stronger than before; in game terms, each player has three oversized character cards, and if you're defeated, you reveal the next card with a booosted-up ability. Alternatively, if the main deck runs out of cards, the player with the most VPs wins.